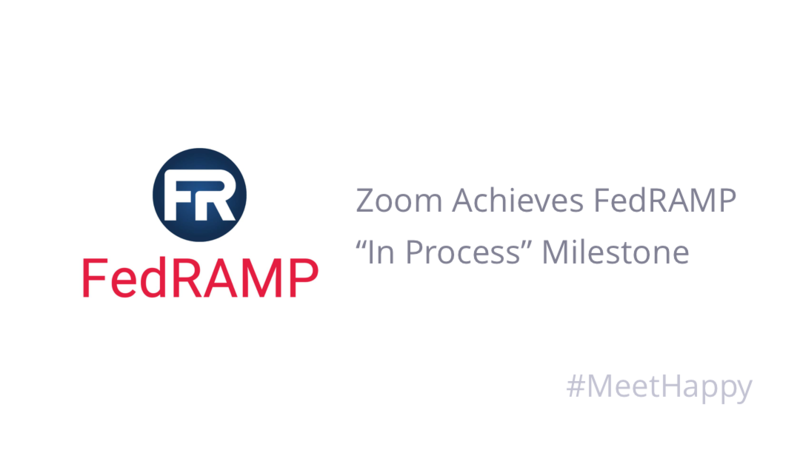 Today Zoom announced that our accreditation under the US Federal Risk and Authorization Management Program (FedRAMP) is “In Process,” under the sponsorship of the US Department of Homeland Security. When full accreditation is achieved, Zoom for Government will be approved for federal agencies to use for video and audio communications across a variety of use cases, such as webinars, large meetings, interviews, API integrations, and trainings, all running on the AWS GovCloud. FedRAMP is a government-wide program that provides standardized security assessment, authorization, and monitoring for cloud products and services. Its certification process includes an in-depth examination of a solution’s data security and governance. Working with the Department of Homeland Security to coordinate progress with the FedRAMP Program Management Office, Zoom has completed all preparatory steps for the authorization process. The FedRAMP marketplace lists an estimated date of authorization for Zoom as December 31, 2018. Zoom’s initial authorization will be at the moderate baseline, and we intend to move to the FedRAMP high baseline in 2019 to address the needs of highly security sensitive organizations like the Department of Defense and the Department of Justice. Those interested in Zoom for Government can visit the FedRAMP marketplace, or contact Rick Drum, Federal Sales for Zoom, at rick.drum@zoom.us.